Camera traps are just the coolest. 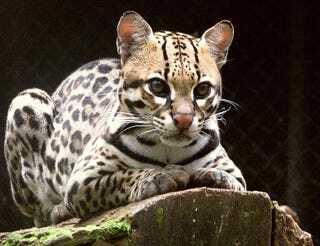 In Nicaragua, scientist Miguel Ordeñana uses them to study carnivores, like jaguars and ocelots. And now the organization that he works with, Paso Pacifico, is teaching local kids to use them as well. Camera traps are rapidly becoming an indispensable part of the field biologist's toolkit. For one thing, they can generate far more data than a researcher can collect him- or herself with more traditional field observation techniques. Data can be continuously collected, all day and all night long. The only limitation is the size of the data card in the camera – which can simply be routinely swapped out. Camera traps allow researchers better access to the lives of shy animals, which may do their best to stay hidden from humans stomping through the jungle, and to the lives of more dangerous animals, who could do some serious damage if given the chance. And they're cheap! At least, cheaper than paying a brigade of field assistants. Miguel recently caught a few glimpses of ocelots (Leopardus pardalis, also known as dwarf leopards), small cats that are known as mesopredators. They're not apex predators, like wolves or sharks, and they don't entirely dominate the food chain. They're different from jaguars, because they need less space, but they're similar in that they are fairly solitary. In the first video above, taken from Miguel's own camera trap, the ocelot seems unaware of a very venomous snake slithering away, which Greg Pauly, herpetology curator at the Natural History Museum of Los Angeles (which is also where Miguel Ordeñana conducts research on urban mesopredators like mountain lions), has identified as a Central American coral snake (Micrurus nigrocinctus). "I was excited because I thought the chances were slim that we would ID it based on a black and white video," Miguel said. "Greg pointed out that you can kind of see the thin yellow bands on the edges of the black bands. The ocelot seemed to have narrowly missed a very dangerous bite. I am glad the ocelot avoided the snake but it I don't know what happened after the video ended." The second video shows the ocelot taking an interest in the camera itself, sniffing around it. The camera may have been baited with a scent as a lure, especially if a fur pad was placed near it. They're small rough bits of fabric that snag a few bits of fur when the cat rubs up against it. It's an easy, harmless way for researchers to collect biological specimens. Since the ocelot is nocturnal, the videos are collected using an infrared camera. Junior Ranger environmental workshops will consist of two modules, one on the carnivore species of Nicaragua and how to recognize their tracks. Junior Rangers will receive track guides and visit riparian zones to look for tracks; we will also place baited track plates near communities in the days before the workshop. In the second module, Junior Rangers will learn about food webs and trophic cascades, focusing on the negative effects of top predator loss on forest structure. Troops will also generate predictions about the kinds of animals they expect to see at nearby versus more remote camera stations, and will review the photographs taken the area and identify animals photographed. According to Miguel, the program is being done in four communities in the Paso del Istmo area, a small stretch of land between Lake Nicaragua and the Pacific Ocean. In addition to camera trap lessons from Miguel, the students are exposed to other herpetologists, ornithologists, entomologists, who conduct research in the area. Above: Miguel Ordeñana teaches the Junior Rangers about camera traps in Nicaragua. Below: Junior Rangers learn about the importance of jaguar conservation. When the researchers aren't around, the program's education staff teaches the 8-14 year old kids about biodiversity, ecology, and the importance of being responsible environmental stewards. The Junior Rangers also assist the adult Paso Pacifico rangers involved in the fieldwork sponsored by the organization, which restores, conserves, and monitors the natural ecosystems of Central America. The Junior Rangers have not yet photographed an ocelot, but they have picked up some grey foxes and other mesopredators, so Miguel is hopeful that they may eventually catch an ocelot wandering by. Photos and video via Miguel Ordeñana/Paso Pacifico, used with permission. Header image via Ana Cotta/Wikimedia Commons.